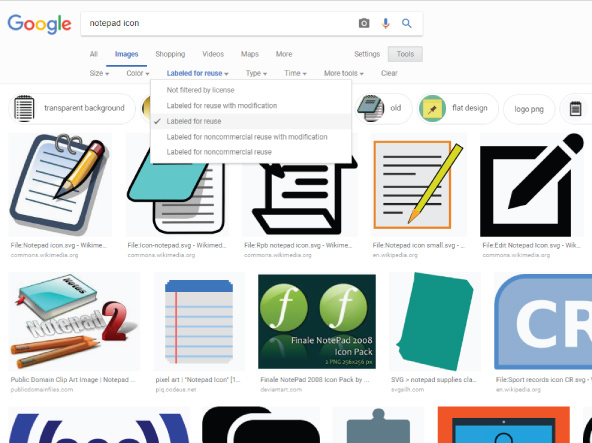 I'm looking for just a very simple icon of just a black and white notepad, but when I use google images its very annoying to have stock photo icon sites to come up where they make you pay for it. Is there a way to filter out all these sites that are polluting the image search results? You use the Noun Project instead. If you still need to use Google, any word in your query preceded by the '-' sign is automatically excluded from the search results. Filter out the commercial sites and paid options by selecting results which have been "labeled for reuse". This means they are free and not restricted by license or copyright. To find simple black and white ones add "black" to your search query, or select the Black filter. Also, when looking for simple icons view the Tools>Type>Clip Art or Line Drawing for more options. Not the answer you're looking for? Browse other questions tagged icon resource-recommendations stock-images or ask your own question. Where do you get industry specific stock photos? How to find sets of images for collages?